Labour has launched its 123-page manifesto. It was an emotive occasion in which Jeremy Corbyn was cheered, as he set out a “programme of hope”, but a handful of journalists were booed. Most of the shadow cabinet were present at the event at the University of Bradford – but several backbenchers seem to have disregarded the leader’s policy offer and are campaigning for re-election on the basis of their achievements locally. Nationalisation of England’s 10 water companies. Manifesto says: Many basic goods and services have been taken out of democratic control through privatisation. This has often led to higher prices and poorer quality, as prices are raised to pay out dividends. For example, water bills have increased 40 per cent since privatisation… [Labour will] replace our dysfunctional water system with a network of regional publicly-owned water companies. Manifesto says: There is a real fear that students are being priced out of university education. Last year saw the steepest fall in university applications for 30 years. Since the Conservatives came to power, university tuition fees have been trebled to over £9,000 a year, and maintenance grants have been abolished and replaced with loans. The average student now graduates from university, and starts their working life, with debts of £44,000. Labour will reintroduce maintenance grants for university students, and we will abolish university tuition fees. Manifesto says: Under Labour’s plans, 95 per cent of taxpayers will be guaranteed no increase in their income tax contributions, and everyone will be protected from any increase in personal National Insurance contributions and VAT. Only the top 5 per cent of earners will be asked to contribute more in tax to help fund our public services. We renew our pledge not to extend VAT to food, children’s clothes, books and newspapers, and public transport fares. Manifesto says: When shareholders are looking for quick short-term returns, they encourage companies to cut corners. That means they look to cut wages, instead of investing for the long term, or they spend longer inventing new tax avoidance schemes than they do inventing new products… Labour will also legislate to reduce pay inequality by introducing an Excessive Pay Levy on companies with staff on very high pay. 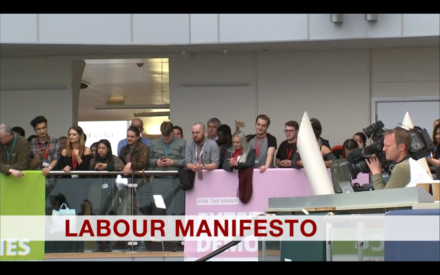 Manifesto says: Labour offers fair rules and reasonable management of migration… Labour will develop and implement fair immigration rules. We will not discriminate between people of different races or creeds. We will end indefinite detentions and distinguish between migrant labour and family attachment and will continue to support the work of the Forced Marriage Unit. Manifesto says: A Conservative Brexit will weaken workers’ rights, deregulate the economy, slash corporate taxes, sideline Parliament and democratic accountability, and cut Britain off from our closest allies and most important trading partners. Labour recognises that leaving the EU with ‘no deal’ is the worst possible deal for Britain and that it would do damage to our economy and trade. We will reject ‘no deal’ as a viable option and if needs be negotiate transitional arrangements to avoid a ‘cliff-edge’ for the economy. Manifesto: On our railways, we pay some of the highest fares in Europe for increasingly unreliable and overcrowded services. The beneficiaries of public funding siphoned off through transport privatisations have been the earnings of directors, dividends for shareholders and the coffers of overseas governments. Labour will prioritise public service over private profit. And we will start by bringing our railways back into public ownership, as franchises expire or, in other cases, with franchise reviews or break clauses.